My eBook went Live !!!!! 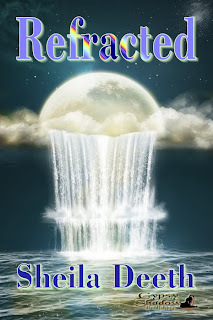 My eBook, Refracted, just went on sale with Gypsy Shadow Publishing. Just click on the link and you can read all about it, read an excerpt, and maybe even buy it (please... pretty please... as my kids used to say). And look! Here's the cover. Isn't it gorgeous? I love the way there's a double rainbow in the writing; it's just perfect! I have a feeling I'll spend lots of today running round feeling excited, sending excited emails, writing excited posts on my various nings and networks, and generally using way too many exclamation points. But WOW!!!! My eBook's really on sale!!!! If this is a dream, then please don't wake me up. The story of a man who gets lost in time and can't remember what he's looking for. I was going to write a really excited blogpost earlier this week. I'd just got the latest version of Refracted back from my editor (my editor!!!) and the document was labeled, "Refracted_Final.doc." "Final!" I felt like my book had passed it's driving test, or like I had. So I was running round the house with a smile and eager to get to the keyboard (or the champagne). But our son came home, keyboard got otherwise adopted, and the washing machine adopted me. Okay, so now it's Thursday. It must be time for an excited blogpost. And indeed it is. But now I'm even more excited because I've seen my "final" cover and it's absolutely beautiful! I've read lots of those blogposts by real authors about their gorgeous covers (and felt suitably jealous) but this one's mine. I have a book cover, beautifully designed, and it's got my name on it, and I'm over the moon. If you post book reviews you'll almost always find you're asked to post ratings too. On many sites, they won't even take the review til you give them a rating. Not a problem, perhaps, unless you happen to have a thing about numbers. And being some kind of mathematician still, I kind of do. The high school I went to, in England, an uncertain number of years ago, had a policy of not teaching "English literature." The theory was we should learn to enjoy reading before being taught to criticize it. The result, of course, was I never wrote a single book review or book report until those uncertainly many years had passed. 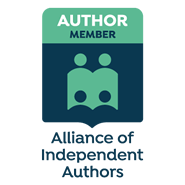 My first book review, on gather.com, was the cause of much personal anguish and trepidation as I wondered if I really dared press that "publish now" button. Never having learned how book reviews are supposed to be done, I'd decided I'd just write what I'd like to read: include enough about the book so I can tell if it might be interesting; include enough about the reviewer so I can tell if their views might be vaguely similar to mine; and never, ever, ever, give away the plot. I got my "first edits" back from Gypsy Shadow, so now I'm preparing to hide in my hole, reading and rereading the manuscript. I've learned that I use "was" and "that" way too much, and "until" is abbreviated "'til" in American, rather than "till" as in English. Meanwhile it's my first time writing the minutes for our local writers' group and guess what! I really do use "was" and "that" too much. So, thank you Gypsy Shadow. Even my first ever edits are helping me improve what I write. I think our new printer doesn't like yellow. Of course, technically, our printer's not new, but it's newer than the old one which requires frequent man(or woman)handling to get the print heads to move. It's big. It's smart. It sends faxes and photocopies vital documents. And it doesn't like yellow. Our writing group's planning a display of self-produced books at the library, so I thought I'd try my hand at producing some. This meant printing them first, of course, in color because I like pictures. But yellow birds and orange sands don't look right when they come out in stripes. "Try cleaning the heads," the trouble-shooting software said. The ink, originally three-quarters full, rapidly sank to one-quarter. "Did that help?" I searched the internet to find out how to print the test page and see. The answer was no. 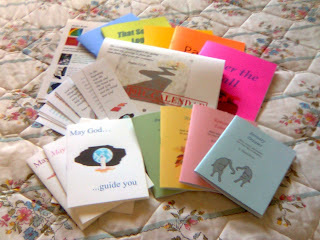 Reading: It seems like ages since I listed linked to my book reviews for That Reading Journey. In fact, it really is ages - almost a month! So, what have I read in the last month? Click the links for my reviews on Gather. Eclipse: I liked it better than the first two Twilight books, so I guess I'd better try to catch up with the fourth one day. Anansi Island: A fascinatingly creepy lunch-time read with an intelligent female protagonist. Fall Asleep Forgetting: Truly wonderful, and one that sticks in the memory, Fall Asleep Forgetting tells the stories of a loose-knit trailer-park community coming to terms with joy and tragedy while beautifully nurturing the rhythms of life. Mean Streets: Well, I am a Harry Dresden fan, and the other novellas here are great introductions to other paranormal mystery writers. Widow's Walk: Another memorable tale, this one has a light touch in dealing with emotional pain, a sure hand with the timing, and an odd and enduring sense of hope. I just won another Versatile Blogger award, this time from my friend Ruth at Abitosunshine Love and Writing. It seems like there's more than "a bit" o' sunshine today, so maybe summer's finally on its way. But I really haven't found any new blogs in the last couple of days since I'm still catching up on blogs and friends that I already know. Maybe I'll let my last post stand as an acceptance of the award, while still thanking Ruth. And if your sun's being slow to wake up to the season, go visit her; it's always shining at Abitosunshine. Many thanks to Donna McDine at Write what Inspires You (http://donna-mcdine.blogspot.com/) for the surprise welcome back from my vacation. In accepting this award I have to thank the bestower (done), share seven things about myself (hmmm, I’m sure I’ve done that somewhere before), and pass the award on to fifteen newly discovered or followed friends. Fifteen! Help! I have a feeling I’ve done this before too, but I’m not sure I’ve newly discovered another fifteen yet. 1) I’ve just been on vacation to San Juan Island. 2) I enjoyed a wonderful cooked gluten-free breakfast every day of my stay at Argyle House while we were there. Absolute luxury. If you’re gluten intolerant you’ll know what a wonderful treat that is. 3) I saw whales, lots of them, courtesy of Bill Carli who so expertly guided our boat—great commentary, great company, great fun.